FORT WORTH, Tex. – Back from the dead. 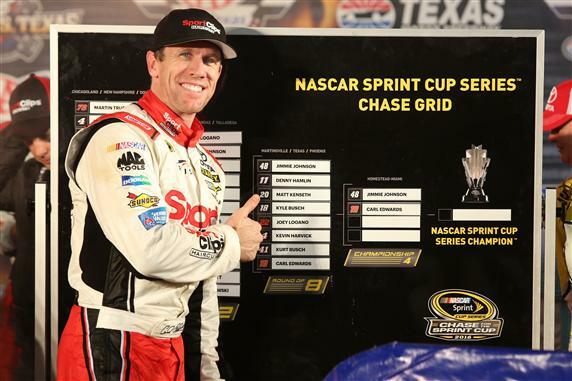 With a Lazarus act that was delayed and then shortened by rain, Carl Edwards revived his moribund championship hopes the only way he could—with a victory in Sunday’s AAA Texas 500 at Texas Motor Speedway. Last in the Chase for the NASCAR Sprint Cup standings after a hard crash and a 36th-place finish last week at Martinsville, Edwards took the lead under caution on Lap 257 when his crew dashed off an 11-second pit stop. Edwards beat Martin Truex Jr. out of the pits, and that proved the difference, as the No. 19 Joe Gibbs racing Toyota held the top spot the rest of the way until a rain shower halted the proceedings after 293 of a planned 334 laps. Winning for the third time this season, the fourth time at the 1.5-mile track and the 28th time in his career, Edwards joined Martinsville winner Jimmie Johnson in the Championship 4 season finale on Nov. 20 at Homestead-Miami Speedway, knowing he’ll have a chance to compete for the series title that eluded him on a tiebreaker in 2011. Joey Logano, who led a race-high 178 laps before losing the top spot while pitting on Lap 188 during a cycle of green-flag stops, was second when the race was called. Truex finished third, followed by Chase Elliott, Kyle Busch, Kevin Harvick and Matt Kenseth. “We had a good AAA Fusion that was capable of winning the race,” Logano said. “We just lost our track position on a green-flag cycle and got our balance off a little bit. We got it fixed and got it going and had a good restart at the end to get back to second but it seemed like we needed maybe five or 10 more laps to try to catch the 19 there. Easy it will not be. Yes, Logano is third in the Chase standings, but by the slimmest of margins. He’s even with Kyle Busch on points but currently holds the tiebreaker on the basis of the runner-up finish at Texas. And Kenseth and ninth-place finisher Denny Hamlin are a dangerous one and two points behind Logano, respectively. Harvick likely needs a victory next Sunday at Phoenix to advance to the Championship 4 for the third straight year. The 2014 champion fought a tight handling condition for most of the race, and on Lap 262 he tangled with polesitter Austin Dillon as the two were racing hard through Turn 4. Dillon slid up in front of Harvick, and contact between the two Chevrolets sent Dillon hard into the outside wall, ending his race. Harvick asserted on his radio that the bump was unintentional. Dillon disagreed. “He is tucked down to my door tighter than anybody did all night,” Dillon said. “He knew how tight he was on my door, and that’s why I got tight and slid up in front of him. He didn’t check (up), but he had the opportunity to. Harvick trails Logano and Kyle Busch by 18 points entering the final race of the Chase’s Round of 8. A driver with an affinity for winning races when his title chances are on the line, Harvick has eight victories at Phoenix, a number that includes five of the last six races. Stewart-Haas teammate Kurt Busch likewise is in a near must-win position. Busch finished 20th on Sunday and enters the Phoenix race eighth in the Chase standings, 34 points behind his brother. Notes: The start of the race was delayed approximately six hours because of rain and track-drying. … Tony Stewart ran 31st, five laps down, in his final Sprint Cup appearance at Texas. … There were eight cautions for 37 laps and 12 lead changes among eight drivers. … Jimmie Johnson, who earned his spot in the Championship 4 with his Martinsville victory, came home 11th on Sunday, breaking a streak of four straight wins in Chase races at Texas. … Kyle Busch’s recovery to finish fifth was almost as impressive as Edwards’ victory. Busch started 24th in a backup car and ran over a piece of brake duct on the backstretch, punching a hole in the right front of his No. 18 Toyota. After his crew patched the hole, Busch salvaged a top-five with hard racing and astute strategy on the part of crew chief Adam Stevens.